Some of you will be only too aware of the potential harm that some substances can cause, in terms of both short term and long term health effects. You may also be reading this in the safe knowledge that your company is low risk, and there’s very little chance of anything going wrong. The only chemicals used are by cleaning staff and the cleaning solutions they use are so low risk “you could drink them”, as was said to me on a recent course. Though I’m not convinced that nothing at all would happen, I got the point. You only have to visit your local supermarket, however, to see the myriad of cleaning solutions that are irritants or corrosives. Take a well known ‘strong’ oven cleaner and look at the instructions – the safety data sheet makes for some interesting reading. Wear full goggles, chemical resistant gloves and use in a well ventilated area. It seems that there are more controls required to use chemicals in the workplace than there are for substances used in the home. Many incidents and cases of ill health when using substances come about as a result of a lack of knowledge about the hazards and risks from the company and the user. Someone recently told me about a company that had revamped the gents’ toilets in their place of work. They said that the contractors were re-laying the floor and had put down a layer of screed. Another contractor in the same area lit a blowtorch and the vapours ignited. Fortunately, as far as I’m aware, noone was hurt, but the points to consider are what was the root cause? Who was at fault? Poor communication, lack of awareness, poor management of contractors, lack of competence. Whether the substances you use are liquids, dusts, gases, or solids such as powder form, or granules, the processes you carry out may result in residual waste that may cause harm to workers or the environment. In particular with substances, it’s essential that assessments are carried out before the product is used and that it covers the lifecycle of that substance. Importantly, before you source your chemicals check to find the safest product on the market that will still give you effective results. Do some research – speak with companies that carry out the same processes. Ask your industry body or safety representative for guidance. REACH (Registration, Evaluation, Authorisation and Restriction of Chemicals) came into force on June 1, 2007, replacing a number of European Directives and Regulations with a single system. The key aim of REACH is to “make the people who place chemicals on the market (manufacturers and importers) responsible for understanding and managing the risks associated with their use.”3 Also, REACH sets out to encourage the development of safer chemicals in the marketplace by enhancing innovation in and the competitiveness of the EU chemicals industry. REACH works alongside COSHH to ensure that better information on the safe use of chemicals is passed down the supply chain. For those of you who are self employed, even if you don’t employ anyone, COSHH still applies in consideration of the potential harm your business undertaking may cause to others and the environment – so you can hurt yourself, just don’t hurt anyone else. A Globally Harmonised System of Classification and Labelling (GHS) is an international agreement, not enforceable in law, providing a single system to identify hazards and to communicate them in transporting and supplying chemicals across the world. In order for GHS to have legal status each country or block of countries must adopt the GHS through legislation. European Union (EU) Member States agreed to adopt the GHS across the EU through a direct acting European Regulation on Classification, Labelling and Packaging of substances and mixtures. This is known as the ‘CLP Regulation’ and came into force in January, 2009. The human body is a wonderful, complex organism, capable of making many internal changes through chemicals and neurons to protect itself from the harmful effects of chemicals in the air that we breathe in and through mucous membranes, or come into contact with through the skin. Sometimes, however, the body just can’t cope with the constant bombardment of chemical substances that it comes into contact with. Our bodies retaliate and our immune systems find it difficult to ward off ill health effects such as coughing, itchy skin, sneezing and runny eyes. Eventually workers may suffer from chronic effects, such as breathing difficulties, and depending on the chemical and exposure levels, in the worst case scenario fatal effects. It is important to be aware that some chemicals may cause serious irreversible, chronic effects immediately. Chemicals may affect vital organs such as the skin – the largest organ in the human body – lungs, liver, or the central nervous system, including effects on the brain. An example of chronic effects is damage to the lungs from Respirable Crystalline Silica dust (RCS) caused through cutting or breaking stone, concrete or brick, or from abrasive blasting and tunnelling4. This can lead to a condition known as Silicosis. Foundry workers’ exposure to ferrous foundry fumes can cause lung cancer, and fume from pattern assembly can cause asthma; spray mists can cause lung diseases, including asthma. The emphasis should always be on reducing the amount of exposure to workers through mechanical means such as ventilation, monitoring of effective reduction techniques, adequate supervision, training and health surveillance measures. Essential control measures include the use of Respiratory Protective Equipment (RPE)5. The first line of action for employers is always ‘if it can be avoided then don’t do it’. In many industries the work has to be done, however, and the employer must therefore ensure that all reasonable measures are taken to prevent or reduce exposure to an acceptable level. Prevent exposure where possible by re-evaluating how the task is carried out. Is there an alternative process that eliminates the use of harmful chemicals? Can steam sterilisation be used instead of Hydrogen peroxide, for example? Employers also have to bear in mind that substitution methods may present other risks, e.g. scald risks from steam sterilisation. Where use of a substance cannot be avoided, is there a less harmful substitute? Or can the substance be used in lower concentrations, or in a less harmful form? For example, can you use granules instead of a powder to reduce the number of fine particles in the air? You can also use preventative and protective measures such as engineering controls (LEV systems), thus controlling potential for exposure at source. Where the chemical is less harmful then General or Dilution, ventilation may be appropriate i.e. open windows to allow more airflow. Other considerations are limiting the number of people who may be exposed, along with reducing the duration of exposure. 1. Design and operate processes and activities to minimise emission, release and spread of substances hazardous to health. 2. Take into account all relevant routes of exposure – inhalation, skin absorption and ingestion – when developing control measures. 3. Control exposure by measures that are proportionate to the health risk. 5. Where adequate control of exposure cannot be achieved by other means, provide, in combination with other control measures, suitable PPE. 6. Check and review regularly all elements of control measures for their continuing effectiveness. 7. Inform and train all employees on the hazards and risks from the substances they work with, and the use of control measures developed to minimise the risks. In the event of a chemical accident, employers can also make an emergency provison for workers by installing showers and eyebath stations – and ensuring all employees know exactly where they are. With many chemicals the use of PPE is essential to protect the worker. When identifying correct PPE/RPE, information should be sought from the manufacturer of the chemical, supplier, trade magazine or industry body to ensure that the most effective solution is used. The requirement for PPE will be identified within the safety data sheet, but it is not always the case that the standard of PPE is stated; for example, BS/CE marking. PPE should be comfortable to wear and be effective in protecting the worker from the specific contaminant to which they are likely to be exposed. If PPE gives discomfort to the worker or poses additional hazards such as restricted vision, or steaming up of a visor, then it is highly unlikely that PPE will be consistently worn. It is the duty of the employer to ensure PPE is not only effective, but is also comfortable so that workers follow safety procedures fully. Discussions with workers regarding PPE should take place on a regular basis, and are essential where it is identified that workers are in violation of wearing equipment. Training and information should include ill health effects that can be avoided through the wearing of PPE. Appendix 7 to the British Standards (extract from British Standards with the permission of BSI under licence number PD1998 1367) was issued on January 8, 2013, and gives information on the harmonisation of European standards and markings for protective clothing. Tables in Appendix 7 give clear information regarding labelling requirements for particular hazard types. The information below is given regarding the labelling of chemical and biological hazard protection. It is the duty of the employer to identify whether there is a need to carry out health surveillance checks and monitoring of workers. This will depend on the chemicals and processes used, and also whether there is a requirement to carry out health surveillance in legislation. There are some simple methods of identifying whether workers are being affected by the substances to which they are exposed. Where substances are known to cause skin irritation or are a known sensitiser – latex, for example – then skin inspections by a competent person would be appropriate. These checks should be carried out on a regular basis in order to spot any early signs of dermatitis, so that appropriate steps can be taken to prevent the condition developing further. If workers are exposed to substances that have the potential to be absorbed through the skin, or may have long term chronic effects on target organs or the nervous system, then the appropriate medical surveillance should be carried out. This may include blood or urine sampling for workers exposed to Tetrachloroethylene, which is widely used for the dry cleaning of fabrics. Lung function tests may be carried out for exposure to substances including flour dust, rosin-core solder fume and glutaraldehyde. An initial baseline test should always be carried out initially in order to measure any ill health effects, and health checks should be carried out at regular intervals. Hopefully you now have an improved understanding of both the requirements and the means to protect your workers from chemical exposure. There’s a wealth of information out there and this is constantly progressing in terms of what is known about how human health is affected. A steady progression of alternative safer methods and safer chemicals and the REACH Regulations will encourage this progression. 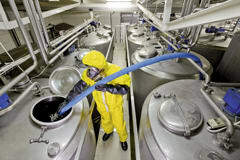 The National Institution for Occupational Safety and Health (NIOSH) website – the Centres for Disease Control and Prevention at www.cdc.gov/niosh – gives valuable information in a clear format with resources, publications and quick links. This is an American website, so take care with guidance.